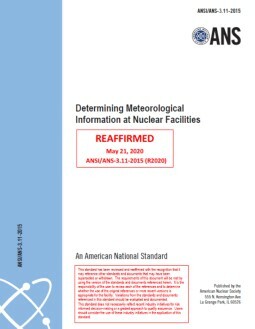 This standard provides criteria for gathering, assembling, processing, storing, and disseminating meteorological information at commercial nuclear electric generating stations, U.S. Department of Energy / National Nuclear Security Administration nuclear facilities, and other national or international nuclear facilities. While well-established monitoring and analysis methods are adequately addressed, this revision provides information on newer systems, both hardware and software, and more modern methods to keep up with the state of the science. Meteorological data collected, processed, stored, and disseminated through implementation of this standard are utilized to support the full life cycle (i.e., siting, construction, operation, and decommissioning) of nuclear facilities. The meteorological data are employed in a large number of applications associated with determining environmental impacts, enabling consequence assessments in routine release and design-basis accident evaluations, supporting emergency preparedness and response programs, and other important applications, such as evaluating beyond design-basis events. The use of meteorological data can also play an important role in various types of environmental, decontamination and decommissioning, air quality, wind loading, and engineering studies. Other uses of meteorological data include assessments of environmental remediation activities, industrial hygiene, construction, and waste management.